Magnificent myrrh and merry mint have joined forces to create a perfectly potent – yet genuinely gentle – addition to our successful self-dentistry serums. Each of the ingredients in our magnanimous Mint & Myrrh Tooth Serum has been used since ancient times to care for the mouth, teeth and gums. Together at last – we bring these ancient essential extracts into an effective alchemy that bestows benefits to a healthy oral ecology. Living Libations Mint & Myrrh Tooth Serum is tough on bacterium and soft on sensitive teeth. Featuring a bouquet of beneficial botanicals including frankincense, myrrh, peppermint, thyme linalool, wild thyme, oregano, and tea tree, Mint & Myrrh Tooth Serum is a natural dentistry kit-in-a-bottle. Frankincense (Boswellia Carterii) – Frankincense oil anoints everything it touches with a sanctimonious essence of sacred reverence. As the best measure of your overall health, your mouth, teeth, and gums deserve the royal treatment with this blessed oil. Frankincense contains unparalleled antiseptic qualities that are said to prevent infections, tooth pain, bad breath, sores, and cavities. 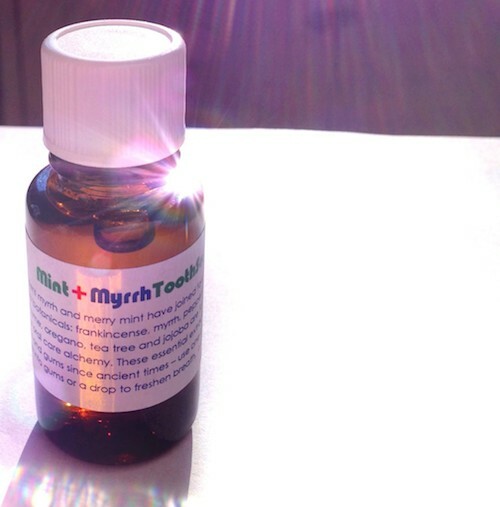 Myrrh (Commiphora Myrrha) – Magnificent Myrrh is the namesake of this serum for good reason. As one of the world’s most ancient botanicals, Myrrh has been revered for thousands of years as nature’s most effective treatment for sore gums. Highly astringent and antiseptic, Myrrh has also been traditionally used to treat wounds, stimulate circulation and healthy growth in gum tissues, treat canker sores, and reduce gum swelling. Peppermint (Mentha Piperita) – Pure, potent peppermint offers more than the minty fresh breath you would expect from a tooth serum. Peppermint is analgesic, antioxidant, and anti-inflammatory. This beneficial trinity is holy indeed: peppermint is said to aid digestion, decrease oral inflammation, and inhibit the growth of decay-causing bacterium in the mouth. Our fourth-generation peppermint distillation offers the pure power artificial peppermint can’t: the ability to prevent gingivitis, one of the biggest traditional benefits of this minty-fresh oil. Thyme Linalool (Thymus Officinalis linalool) – Where does the thyme go? Deep into the far-reaching recesses of your most neglected oral nooks and crannies. This rare variety of thyme is a gentle antiseptic renowned for its ability to tone tissues. Thyme, Wild (Thymus Vulgaris) – Wild thyme is a famous breath freshener, but it is the lesser-known qualities of this multi-faceted oil that provide the biggest oral care benefits. In traditional dentistry, thyme is combined with a chemical called chlorhexidine and used as a protective varnish against tooth decay. In natural dentistry, thyme has been historically used for oral care for centuries. Oregano (Origanum Vulgare) – Fresh and wild from the Mediterranean mountains, our Oregano oil offers an arsenal of oral protection. Oregano is packed with beneficial phenol compounds, which contain potent antifungal, antibacterial, antimicrobial, and antibiotic properties. In addition to boosting overall immunity and fighting fungi, Oregano oil is said to prevent plaque buildup in the mouth while fighting, and even preventing, gum disease. Jojoba (Simmondsia Chinensis) – Jojoba is known for its incredible skin benefits, but it is also a chief player in natural oral care. Jojoba’s loving lipids easily transfers its soothing properties to teeth, and gums.